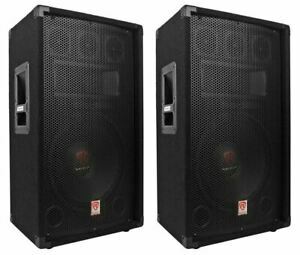 Increase the efficiency of your instrumental stage performances with this active stage floor monitor speaker. The two-way monitor delivers distortion-free sound at extreme Sound Pressure Levels (SPL). Power levels are 250 Watt Root Mean Square (RMS), 500 Watts of program power, and a peak high of 1000 Watts. LEDs display power and the points where sound clipping takes place. Its two-way component allows for both live sound and playback. Directe betaling van US $154,95 is vereist.